A few cloud tufts appeared in the evening but basically yesterday was a clear day. I saw no chemtrails. Today is beautiful. 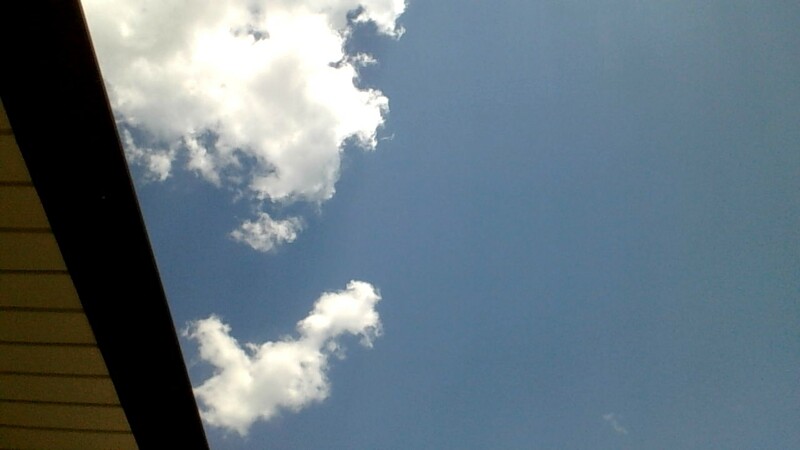 Perfect temperature, mostly sunny with just the right amount of cumulus clouds. There appears to be a definite lull in the chemtrail activity. I have seen no classic form chemtrail all week. And that is most unusual. Sure, I have seen some mysterious cirrious clouds (my name for dubious cirrus clouds) but no actual chemtrails. Remarkable. Note in the pic above how the cumulus clouds seem to be in the process of dissolving around the edges? I hypothesize, as I have said before, that this is due to lingering aerosols floating in the air. It is precisely these lingering aerosols from earlier chemtrail spray that makes the sky seem pale blue. As cumulus clouds float through these ambient aerosols they dissolve around the edges. These particular clouds are holding together fairly well. Obviously there is less ambient aerosols in the air today due to the lull in chemtrail activity. Still, there is some dissolution, suggesting that the aerosols sprayed by chemtrailers can linger in the air a very long time. 1:00 PM. 5:50 PM. I was hoping to capture the rays of the sun as they highlighted the nebulous film of aerosol particulates in which these cumulus clouds are suspended in this picture. Unfortunately the radiating beams are a little too faint to be picked up by my laptop camera. You can just make out the edges of the beams in the left half of the picture half way between the roof and the cloud bank. These rays illuminate the particulates floating in the air, much as a flashlight in the dark reveals dust particles caught in its glare. This is the stuff that is hanging in the air perpetually, even, as we see here, when there has been no chemtrails sighted in a week. This is what we are breathing, 24/7, even when there is a lull in the spraying. 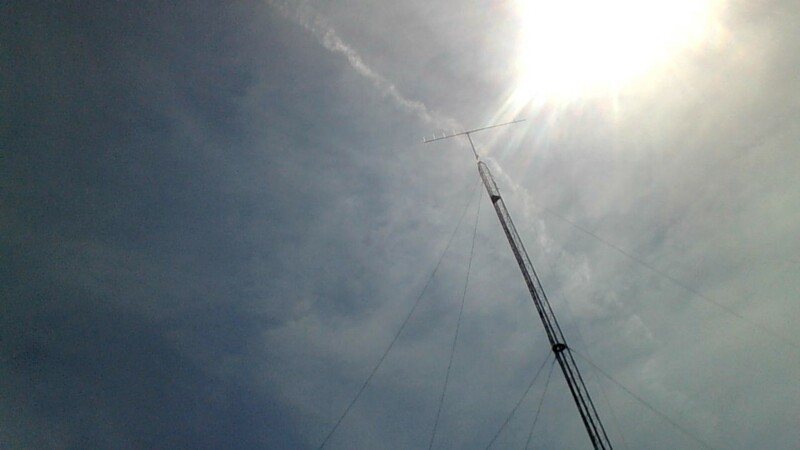 The aerosol plasma. We’re living in a gigantic, probably nation wide, bubble of aerosol plasma. Today the sky is clear but pale, even hazy in the distance. Remarkably, no chemtrails sighted. The paleness in the absence of chemtrails underscores the extent to which particulates linger in the atmosphere. The sky is still pale even after a week’s lull in the spraying. Whether these particulates are lingering from spraying here or are drifting in from sprayings elsewhere, the effect is the same. Pale blue skies. The paleness denotes the aerosol plasma bubble in which we live. I had seen the filmy striated clouds in the eastern sky earlier, but no identifiable chemtrails. These were the kind of clouds chemtrails dissolve into, but this was the first freshly laid chemtrail I have seen today. It is, in fact, the first I have seen in a week. 1:30 PM. Now this is interesting. Remember the analogy I made about dust particles being captured in the beam of a flashlight? 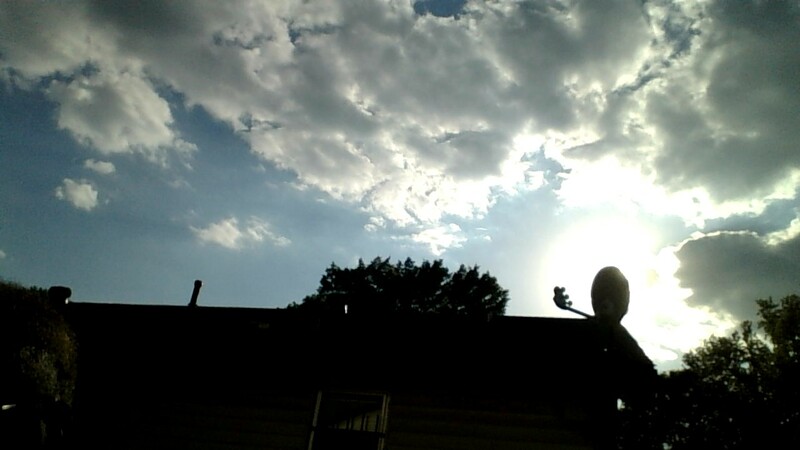 Well, what I do when I want to look directly towards the sun while simultaneously blocking the sun itself is to stand behind/in the shadow of the satellite dish on the roof. It’s the perfect size for blocking out the sun. This time, however, I noticed something I had never seen before, too minute to show up on this photo. 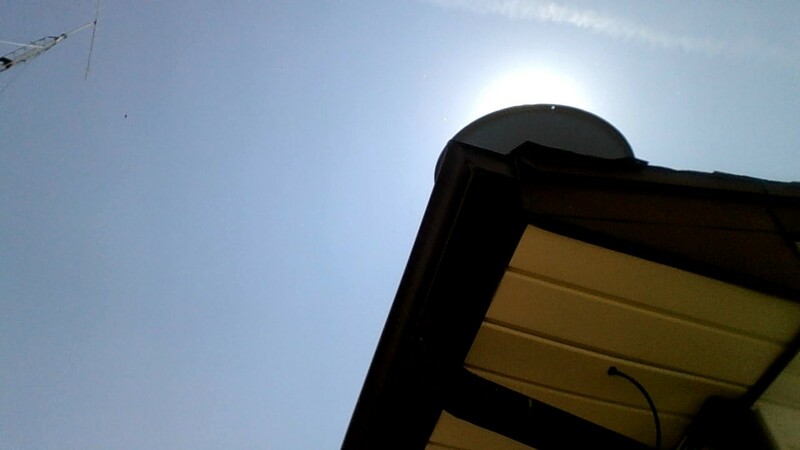 Looking at the halo around the satellite dish, the blocked sun, I could see caught in the glare tiny glittery specks milling around, seemingly descending from the sky. And not microscopic sized particles either. They were relatively large. Smaller than glitter or salt grains, but still quite noticeable. It makes me wonder if these glittery specks reflect something that has happened locally, like a truck spill, or is this some kind of chaff dropped from those chemtrail planes? I never thought that the particulates were big enough to see with the naked eye. Nope. Damn! This is the stuff! I just went outside to take a second look at the particles in that halo. And the glittery particulates stretched upward into the distance. It’s not coming from some local event. It’s coming from the sky. These are the chems from the chemtrails. I will have to check on the presence of particulates this way on a regular basis to determine if what I have just seen is anomalous. It may well be that glittery particulates in the air is normal, that is not to say natural. It may be normal but the reason that it is is because of the constant spraying I have been chronicling here. It could be that I have simply never noticed them before. But if indeed that is true and these particulates are omnipresent, then that confirms my theory of an invisible aerosol plasma constantly hanging in the air that reveals itself when it interacts with and dissolves cumulus clouds giving them that now familiar frayed appearance. Okay. An hour or two later, I’m beginning to think what I have just described as normal. The particulates I am able to reveal this way could very well be dust particles. I suppose that is a likely explanation. Still, at that initial observance there was much more of it than when I checked later. Also the glittery appearance may have been an illusion caused by the glare of the sun. The revealed particulates’ connection to the chemtrail project is inconclusive. Maybe these are sprayed particulates caught in the glare of the sun, maybe not.